Not to be confused with Monroe Township, Michigan or Munro Township, Michigan. 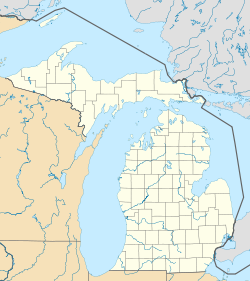 Monroe Charter Township is a charter township of Monroe County in the U.S. state of Michigan. As of the 2010 census, the township population was 14,568. The City of Monroe is adjacent to the township. The township was organized in 1827 and named after James Monroe, the 5th President of the United States. West Monroe is an unincorporated community and census-designated place located at 41°54′50″N 83°25′54″W﻿ / ﻿41.91389°N 83.43167°W﻿ / 41.91389; -83.43167 within the northwest portion of the township. Monroe High School is located in West Monroe. South Monroe is an unincorporated community and census-designated place located at 41°54′45″N 83°25′04″W﻿ / ﻿41.91250°N 83.41778°W﻿ / 41.91250; -83.41778 within the northern portion of the township. According to the United States Census Bureau, the township has a total area of 18.4 square miles (48 km2), of which 17.4 square miles (45 km2) is land and 1.1 square miles (2.8 km2) (5.80%) is water. As of the census of 2010, there were 14,568 people, 5,312 households, and 3,686 families residing in the township. The population density was 777.0 per square mile (300.1/km²). There were 5,572 housing units at an average density of 320.9 per square mile (123.9/km²). The racial makeup of the township was 94.93% White, 1.87% African American, 0.19% Native American, 0.82% Asian, 0.01% Pacific Islander, 0.79% from other races, and 1.39% from two or more races. Hispanic or Latino of any race were 1.97% of the population. There were 5,312 households out of which 33.5% had children under the age of 18 living with them, 52.4% were married couples living together, 12.3% had a female householder with no husband present, and 30.6% were non-families. 26.7% of all households were made up of individuals and 10.9% had someone living alone who was 65 years of age or older. The average household size was 2.50 and the average family size was 3.02. In the township the population was spread out with 26.2% under the age of 18, 8.5% from 18 to 24, 29.5% from 25 to 44, 22.3% from 45 to 64, and 13.4% who were 65 years of age or older. The median age was 36 years. For every 100 females, there were 93.1 males. For every 100 females age 18 and over, there were 89.7 males. The median income for a household in the township was $45,694, and the median income for a family was $52,517. Males had a median income of $44,949 versus $26,674 for females. The per capita income for the township was $23,276. About 8.2% of families and 10.7% of the population were below the poverty line, including 14.1% of those under age 18 and 8.8% of those age 65 or over. The township is home to the Tenneco North American business unit. Tenneco manufacturers Monroe shock absorbers and struts, as well as emissions control equipment. Just under 500 people are employed by Tenneco in Monroe. ^ "City of Monroe - Industry". 2007. Archived from the original on 28 July 2009. Retrieved 23 June 2008.